Pets are Family too! 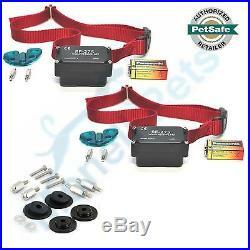 2 PRF-275-19 Petsafe Stubborn Dog Fence Collar Receivers and RFA-529 Refresh Kit. 2 (Two) Petsafe PRF-275-19&###xA0;Receivers for Large or Stubborn Dogs. &###xA0; Comes with RFA-529 Refresh Kit. These 2 extras&###xA0;receiver collar can be used to add&###xA0;additional dogs to any PetSafe in-ground fence system or as replacement collars to the Stubborn Dog In-Ground Radio Fence (PIG00-10777) or any Petsafe In-Ground Dog Fence. WILL NOT WORK WITH the PIG00-11115 Yardmax System or Innotek UltraSmart system. Designed for stubborn, large or hard-to-train pets. 4 adjustable levels of static correction, plus tone with vibration only option. Uses 9-volt alkaline battery (included). 2 PRF-275 Receivers and Straps. Long & Short Contact Points. Refresh your pet’s fencing collar with components from this universal kit. Includes long and short/standard contact points plus replacement pieces for your pet’s fence receiver collar. The washers are used to keep the receiver attached to the strap. The protective clear caps help to keep water and debris out of the switch port on receivers with correction level adjustment buttons. The 4 screws can be used to replace the receiver screws on Stubborn Dog receivers. Compatible with most PetSafe wireless and In-Ground Fence systems and Pawz Away pet proofing barriers. (2) stainless steel contact points 1/2. (2) long stainless steel contact points 3/4. 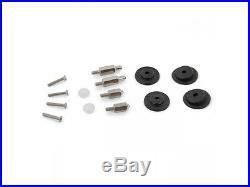 (2) plastic contact retaining washers. (2) plastic collar washers. (4) stainless steel receiver screws. We are an Authorized Retailer for the Brands listed below, and many more. &###xA0; If UPS is working, so are we! &###xA0;&###xA0;&###xA0;&###xA0;&###xA0;&###xA0;&###xA0;&###xA0;&###xA0; &###xA0;&###xA0;&###xA0;&###xA0;&###xA0;&###xA0;&###xA0;&###xA0;&###xA0;&###xA0;&###xA0;&###xA0;&###xA0;&###xA0;&###xA0;&###xA0;&###xA0;&###xA0;&###xA0;&###xA0;&###xA0;&###xA0;&###xA0;&###xA0;&##xA0. We understand that there may be instances when you must return our product. We want to make it an easy return procedure for you. If parts are missing, we will deduct the cost of the missing item. Items showing wear or use, evidenced by pet hair, dirt, etc. Items such as Wire Break Detectors, open battery packages, litter boxes, Booster Baths are not returnable. Wire, once unwound and/or off the spool, used flags or sod staples are not eligible for return. See our other items. 2 (Two) Petsafe PRF-275-19 Receivers for Large or Stubborn Dogs Comes with RFA-529 Refresh Kit Quick Overview These 2 extras receiver collar can be used to add additional dogs to any PetSafe in-ground fence system or as replacement collars to the Stubborn Dog In-Ground Radio Fence (PIG00-10777) or any Petsafe In-Ground Dog Fence. Kit includes: — (2) stainless steel contact points 1/2″ — (2) long stainless steel contact points 3/4″ — (2) plastic contact retaining washers — (2) plastic collar washers — (2) switch caps — (4) stainless steel receiver screws. The item “2 PRF-275-19 Petsafe Stubborn Dog Fence Collar Receivers and RFA-529 Refresh Kit” is in sale since Wednesday, September 21, 2016. This item is in the category “Pet Supplies\Dog Supplies\Training & Obedience\Electronic Fences”. The seller is “monellpets4u” and is located in Oak Ridge, New Jersey. This item can be shipped to United States.